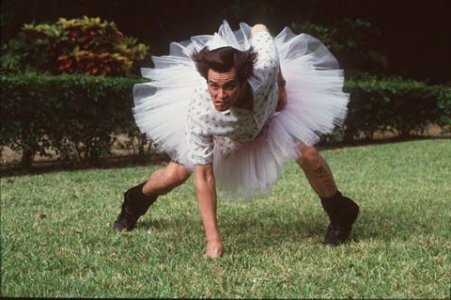 As a Patriots fan, Ace Ventura holds a bit of nice trivia. Anytime a Dolphin fan gets a little aggressive in their venom towards the Pats, I can always remind them that the last time Miami made it to a Super Bowl was in Ace Ventura: Pet Detective. The plot is insanely simple. The Miami Dolphins mascot is kidnapped, and Jim Carrey is a Pet Detective called in to solve the case. I watched ACE VENTURA: PET DETECTIVE (1994) on 1.8.09. I’ve seen it probably two dozen times, though this was the first time in eight or ten years. I was surprised to see how low I ranked this. I still consider it a classic comedy, but it certainly is not well made by any means. ~ by johnlink00 on January 8, 2009. Too bad Jim Carrey spneds his free time killing people through ignorance. You may disagree with his philosophy (which obviously you do), but to say he’s ‘killing people through ignorance’ might be a taaaaaaaaaaad harsh. It isn’t a philosophy, it’s false confidence. Celebrities giving medical advice with no medical basis is wrong. He and Jenny McCarthy have an actual body count. I don’t have a clue what philosophy/false confidence Jim Carrey might be participating in, but I think if you’re going to make an inflammatory statement like “he spends his free time killing people through ignorance” it might behoove you to provide a link or two showing actual evidence to support a claim like that… At worst please enlighten the rest of us who don’t know what you’re talking about. Good doctor, please relieve me of my ignorance!